Sure, you’ve invested a considerable amount of money into your online marketing campaigns, and you’re beginning to see positive results. On the other hand, are you actively tracking and measuring your online presence, rankings, and traffic? Without an accurate presence tracking and traffic metrics system that sources, aggregates, and displays vital data, you won’t be able to gain valuable insight that will enable you to optimize your website for maximum lead and sales conversion and enhanced ROI. Interested in discovering the benefits to using a dynamic presence tracking and traffic metrics system? Then read on! 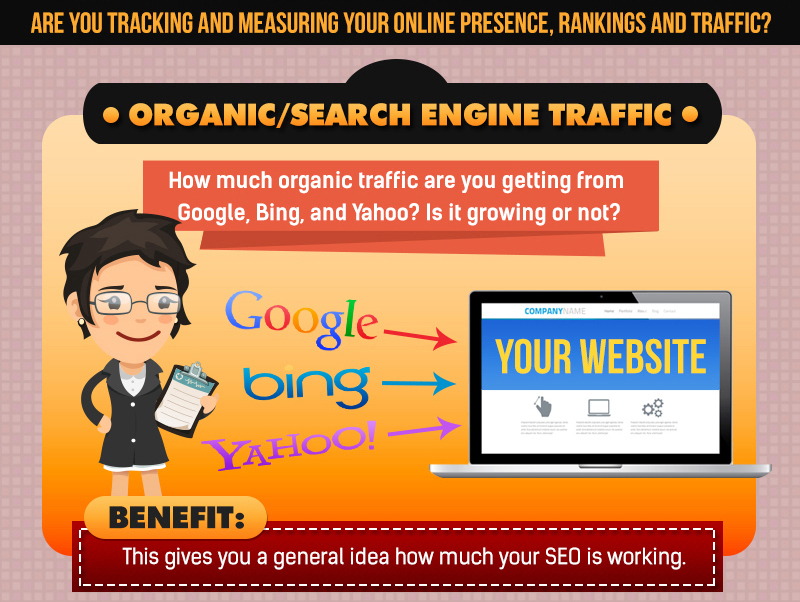 How much organic traffic are you getting from the major search engines—Google, Bing, and Yahoo? Is your organic traffic growing or has it plateaued? If you cannot answer these questions, then you’re not seeing the bigger picture! Monitoring your organic search engine traffic is vital to the continued optimization of your business website and the success of your online marketing campaign. Without organic search engine traffic data, you wouldn’t know how much traffic your website is getting from the major search engines. Do you know what search queries and keywords people have typed into search engines that displayed your website in the search results? Without an advanced presence tracking and traffic metrics system, you wouldn’t have access to your search query and keyword data, and your SEO efforts will suffer. Neither would you know the average position of your website in the search engines for each search query, what pages on your website are getting high or low rankings, or what pages are getting the most or least amount of traffic. Therefore, you’ll have no idea what content and pages should be optimized. In other words, without organic search engine traffic data, you wouldn’t be able to objectively determine if the time, money, and effort you’ve invested into your web pages is paying off or if they were completely wasted. Do you know the overall performance of your web pages? Do you know the exact web pages that get displayed and visited after coming up in the search results for different queries? Do you know what the average position of each of your web pages is? Studies show that the first organic result on the first page of Google’s SERPs has an average click-through rate (CTR) of 17.16%. The second organic result has an average CTR of 9.94%, with the third managing an average CTR of 7.64%. The sixth, seventh, and eighth positions manage average CTRs of only 1%, with the tenth position managing an average CTR of only 0.51%. It is clear from these statistics that it is very important for websites to attain the first ranking on the first page of Google’s SERPs if they want to drive maximum traffic, leads, and conversions to their websites. By gaining access to your website’s rankings, impressions, clicks, & CTR metrics, you’ll know if your search engine visibility is expanding, and for what search terms and keywords. You’ll also know what keywords to optimize to improve your website’s rankings on the organic SERPs of major search engines. You’ll be able to determine how popular your brand is by assessing your search volume for queries that mention your brand. Lastly, you will know what web pages and content are ranking and bringing in the most traffic, and you’ll know how to optimize those web pages and content for maximum conversions. Do you know how much traffic your website is getting from external websites? Traffic coming to your website from external sources is known as referral traffic. External sources include blogs that are recommending your business by placing outgoing links from their blogs to your website; online directories you have listed your website on; national or regional news sites (as well as industry news sites) that have picked up your press releases or content, and have placed links in their stories to your website; and online forums that are talking about your business and linking to your website. By gaining access to your website’s referral traffic, you’ll know much traffic you are getting from online directories. You’ll know if people are talking about you, what they are saying about you, and which of your web pages they’re linking to from their blogs and online forums. You’ll also know if people are sharing your content and linking back to your website, and if your business and website are being featured on different news sites via your press releases and other publicity campaigns. Do you know how much traffic your website is getting from social media? Your social media traffic comes from your social media accounts, such as your Facebook profile/posts, Twitter profile/posts, Google+ profile/posts, and LinkedIn profile/posts. While social media marketing is great for reinforcing brand awareness and encouraging positive engagement with your leads and clients, you won’t be able to plan successful social media marketing campaigns or improve existing ones without consulting social traffic data. By gaining access to your social media traffic, you’ll know exactly how much traffic you’re getting from your social media accounts and posts. You’ll also learn which of your social media accounts is better at driving traffic and which of your posts drives the highest CTRs. With the valuable insight you’ve gained, you can optimize your social media accounts and drive more visitors, leads, and conversions. Do you know how much traffic you’re getting from your online advertisements? Your paid traffic data comes from platforms such as Google AdWords (including AdWords Remarketing), Yahoo! Bing Network, and Facebook Ads. By actively monitoring the traffic being generated by your online ads, you’ll be able to objectively determine if the money you’ve invested in paid traffic services, like pay-per-click (PPC), has generated decent ROI. You can avoid spending blindly on online advertising as well as serious financial losses by analyzing your paid traffic data to gain valuable insights. Do you know how much direct traffic your website is getting? Do you actively and consistently measure the direct traffic your website is getting? By reviewing your direct traffic data, you’ll be able to identify which of your URLs is the most popular destination for direct traffic, which addresses appear most often in Google’s auto-completion, and which of your web pages is bookmarked most often. Such valuable data will give you the opportunity to redesign your web pages so that they address users’ needs both accurately and quickly. Moreover, since your website’s URLs are mentioned in your traditional advertising campaigns, analyzing direct traffic data will help you determine how successful your traditional advertising campaigns are at directing traffic to your website, and will help you gauge the strength of your brand recall and domain recall. Do people visiting your website like what they see? Do they find what they are looking for? How engaged are your visitors? Are your pages loading fast enough? Your website’s abandon rate is the percentage of single-page sessions—or sessions that resulted in the visitor leaving your site from the entrance page without interacting with the page. Websites with high abandon rates generally have lower sales and lead conversions. There are many factors that contribute to high abandon rates. Visitors tend to leave websites from the entrance page if the site possesses design and usability issues. Perhaps the website takes too long to load or the web pages aren’t optimized properly (i.e. the web pages do not correlate with the search terms that brought visitors to the website, or the web pages do not correlate with the ads being run or the keywords that were purchased). By keeping a close eye on your website’s abandon rate, you’ll know if people like what they see on your website, and if people find what they’re looking for. You can also use your freshly gained insight to optimize your website’s design and content, and measure your visitors’ depth of engagement on your website. This in turn can significantly lower your website’s abandon rate and positively impact your sales and lead conversions. Gain Cutting-Edge Insight by Measuring Your Online Presence, Rankings, Traffic, and Other Metrics with Our Easy-to-Use Advanced Presence Tracking and Traffic Metrics System! You need to gain cutting-edge insight into your website’s presence, ranking, and traffic so that you’ll know what to optimize to drive maximum conversions and what areas to invest your marketing budget in for maximum profitability. In today’s competitive business environment, you cannot afford to take your online presence, rankings, and traffic metrics for granted. Your competitors certainly aren’t. Do you want to be left in the dark about your business website’s current state, and continue to blindly apply various strategies without being able to measure conversions and other factors? Of course not! Avoid being Crushed by Your Competitors! Contact us now to start measuring your website’s presence, traffic, and performance to learn which online strategy to implement. Call us now for a free consultation!